There was a small village. It had a pit in which a big cobra snake lived. On the occasion of ‘Nagula Chaviti’— fourth day after the new moon, the people of the village came to the pit to worship the snake. The snake observed that while the people worshiped it they were quite scared too. Children and adults ran away on seeing the snake. The snake was unable to understand that. ‘How can I stop them from running away from me?’ asked the cobra. ‘If they know that you will not hurt them then they will not run away from you,’ said the wise monk and went on his away. 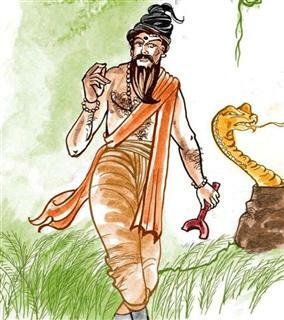 After some days, the monk again saw the cobra on his way back. ‘I told you not to bite them but didn’t ask you to stop hissing at them. One should not forget one’s own character traits,’ said the monk and went away. There are many varieties of non-poisonous snakes as well. If we kill the snakes which only hiss then our houses will be full of rodents. One pair of rodents gives birth to more than a crore of rats in a year. That's how their tribe multiplies. 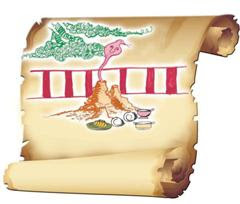 In many areas during ‘Nagula Chaviti’, eggs and milk are offered to the snake. Have you ever thought of the reason behind the custom of worshiping snakes? Snakes are the friends of farmers. Snakes eat rats which damage the crops so they are very useful to us. We are scared of snakes and kill it. So there is a need to save the snakes from being killed. Maybe that’s the reason sanctity has been attached to them. Are people frightened that the snake might seek vendetta? Discuss with your elders. We need to understand one thing. Snakes are not poisonous animals. In our country, out of the reptiles found only four species of snakes are poisonous. People have many misconceptions regarding snakes. Misconceptions like snakes drink milk and snakes seek revenge etc. In reality, snakes never nurse grudges. Similarly it is believed that snakes sway when a snake charmer plays the pipe. This is also not true because snakes do not have ears and cannot hear the music. A snake swings and moves its head to match the movement of the pipe.